The basic rules of fire safety, campfire safety and fire prevention should be taught to children as young as preschool age. Incorporating hands-on activities and craft projects helps young kids to learn and remember those important rules. 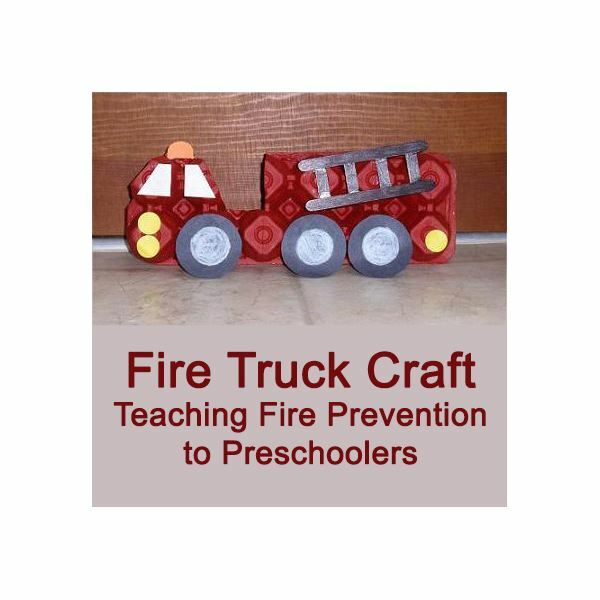 This fire truck craft for preschool children will also offer opportunities to practice shape recognition, painting, cutting, gluing and drawing skills. To create the egg carton fire truck craft pictured below, follow the provided materials list and instructions. Collect the cardboard egg cartons ahead of time (one carton per child). To prepare each egg carton for the project, place the egg carton lengthwise and cut a 2-inch by 2-inch section out of the second and third cups on the top portion. You may also choose to cut off a small diagonal section from the first cup. The point of the cuts is simply to make the carton more closely resemble the shape of a fire truck. Also, cut two wooden craft sticks in half for each project. Cover the work surface with newspaper to protect it from paint and glue residue. Give each child an egg carton, paint brush and red paint. The egg carton may also be colored with markers, if desired. Instruct the class to completely cover the front (the protruding side of the cups) and sides with red. Place the egg carton aside to dry. Let the children begin working on the ladder for the fire truck. Give each child two full size wooden craft sticks and four half sticks. Have them color one side of the wooden craft sticks with black marker. Instruct the children to place the two full size craft sticks an inch apart (color side down). Show them how to arrange the four half piece across the two longer sticks to form the rungs of the ladder. Attach each stick with a small amount of glue and set aside to dry. Give each child construction paper and instruct them to cut out three circles for wheels. Have them use white chalk or crayon to draw a smaller circle inside of each paper one. Let the kids decide on the colors. There is no rule that wheels can only come in one color! Also, have them cut two small rectangles (triangles will work, too) for windows. Once the egg carton is dry, help the kids glue the wheels, windows and ladder in place on the egg carton fire truck. Provide shape stickers for the children to create the finishing touches to the truck, such as headlights, taillights and a siren. This fire truck project is great to incorporate into a fire safety lesson to help children learn and remember important facts about safety.